Serum is the liquid fraction of clotted whole blood. Unlike plasma, no anti-coagulant will have been added to the blood following collection from the animal. Serum is centrifuged to separate the clot from the liquid phase, resulting in a product that is depleted of cells, fibrin and clotting factors. What does it mean when FBS is labelled as USDA Grade or European (EU) Grade? USDA Grade FBS is FBS of non U.S.A. origin that the United States Department of Agriculture (USDA) considers to be acceptable for importation in the US.A. These countries are defined as being free of bovine spongiform encephalopathy (BSE) and foot and mouth disease (FMD). Countries include New Zealand, Australia, Mexico and other Central American countries. What does the ‘Country of Origin’ refer to? 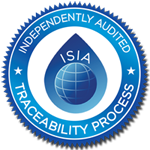 What does it mean to be ISIA Traceability Certified? All LSP FBS is tested for Bovine Viral Diarrhoea Virus (BVD-V), Bovine Parainfluenza-3 virus (PI3), Infectious Bovine Rhinotracheitis (IBR) and Bovine Viral Diarrhoea Virus antibodies (BVD-AB). Each batch of LSP FBS is tested for the absence of bacteria, fungi, yeast, mycoplasma. LSP FBS is also sterile filtered through three sequential 100 nm (0.1 µm) pore size-rated filters. Results of microbe testing of each batch of serum is supplied in the COA. However, please note that sterility is not guaranteed after opening. What level of quality assurance can I expect from LSP for FBS products? Can my FBS be treated before shipping? Yes. FBS is available as heat inactivated, gamma irradiated, dialysed and charcoal stripped material. FBS is supplied in 500 mL bottles. Other pack sizes or presentations are also available on request e.g. 100 mL and 1 L bottles, or individual supplier packs. Can I sample batches of FBS? Yes. LSP offer samples of FBS for testing prior to selection of a suitable batch. Typical sample size is 50 mL and reservations are held for a period of four weeks, pending evaluation.